The web's best resource on this category is at the outstanding site: http://www.hpmuseum.org. Computer or Calculator? This was a very fuzzy question during HP's first 10 years in the "small" computer business. Beginning with the 9100, most of the early machines were called calculators by HP. This nomenclature was solely for the purpose of circumventing the cumbersome purchasing cycle for "computers" that most companies employed. Most computers were big, expensive and delicate. Firms buying "computers" used a much more extensive review process for acquisition than they used when acquiring "calculators". So, "calculators" were easier to sell. As a result, anything that could be remotely considered to be a calculator was called a calculator. Even the 9845 was sometimes referred to as a calculator. The definition used by the museum is "If it fits nicely into the glass calculator display case, then it's a calculator, unless it's a 46 or 81 (too big to fit but still a calculator) or a handheld computer (71, 75, 94 or LX handheld)." The handheld calculator business was like no other in HP history. The HP-35 was the most exciting product ever introduced by the company. The HP-35 was HP's first ever retail product and a brand new category for both the company and for the industry. In its first year on the market, the HP-35 alone accounted for 41 percent of HP's entire profit. 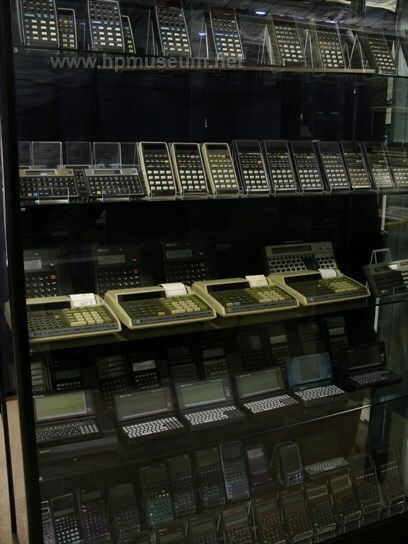 In 1973, the calculator business was almost as big as the rest of HP's data products businesses combined. But, the handheld calculator business flared out quickly. The business saw almost no growth in the latter half of the 1970s and by 1980, claculators accounted for less than seven percent of HP's data products business. By 1990, calculators were less than one percent of HP's total business. Calculators are great to collect because they are so small. But there are plenty of add-ons, accessories, software and third party products to make HP calculator collecting a full time obsession. We have found significant variability in the reliability of early HP handheld calculators. The very first models based on the HP-35 form factor are still extremely reliable. These models include the 35, 45, 55, 65, 67 and 80. As of 2015, more than 90 percent of these models that have come through the museum still work wonderfully. By contrast, the subsequent 20 Series calculators are far less robust. These models include the 21, 22, 25, 27 and 29. We have found that fewer than 50 percent of these units still function properly. The 30 Series models from the late 1970s fall somewhere in between with respect to ongoing reliability.